Think a city chef can’t satisfy your craving for coastal seafood? 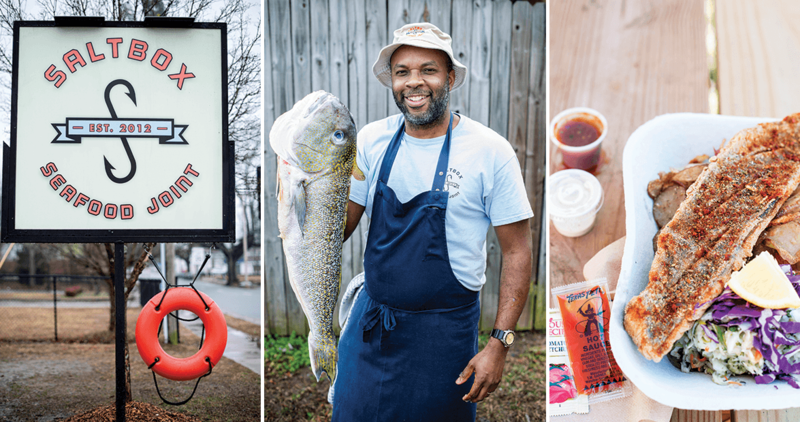 Meet Ricky Moore of Saltbox Seafood Joint in Durham. On family outings when he was a boy, Ricky Moore loved to fish in Cold Creek off N.C. Highway 101. The spot is located between his mother’s and father’s home places, in Riverdale and Harlowe, respectively, not far from their home in New Bern. When it was his turn to use a pole, Moore would throw his line as far as he could, wondering where life might take him. He was born at Marine Corps Air Station Cherry Point, where his father served in the U.S. Army. By the time he was 7, his family had already lived in Germany, Texas, and Kentucky, and returned to New Bern. Wanderlust led him to join the Army right after high school. He served 10 years in Hawaii, where he met his wife. The world was his oyster, but Moore was surprised to discover that the place he most wanted to start a new venture was his home state. And, true to his childhood roots, he wanted to cook fish. With an impressive résumé and a recognized name, Moore could have located Saltbox in a larger space or a more affluent setting. Instead, he followed his gut — and heart — and opted for a no-frills location and a vibe that mirrors his view of what good food is truly all about. Here, there’s no dining room. No bar. No valet parking, hostess, fancy decorations, or upscale ambience. But no matter. Customers still line up every day, rain or shine, in the grass-and-gravel parking lot outside Saltbox, often crowding in before Moore has a chance to flip the window sign from closed to open. But it’s not the press or even the word of mouth that keeps people coming back. The draw is simple: It’s the taste and aroma of perfectly cooked, imaginatively seasoned, impeccably fresh fish. Moore’s gleaming supply is trimmed into portions and dusted with Saltbox’s signature spice mix, a fragrant blend of toasted fennel and lemony coriander that seals the meat under a whisper-thin crust. The fish is then dunked into a sizzling fry basket or grilled on a smoking-hot cast-iron skillet. Accompaniments, including honey-drenched hushpuppies and hand-cut coleslaw, are simple but artfully staged — the red cabbage goes on the coleslaw last, to keep vibrant colors separate. House-made chips are amped up with the addition of fried onions and green bell peppers. “If hash browns and French fries got together and had a baby, this would be it,” Moore declares as he seasons a batch and flips them in a large metal bowl to ensure that each crunchy bite is delicious. Open Tuesday through Saturday, 11 a.m.-7 p.m. (or until the fish runs out).